Podcasts to enable and encourage you - for God’s sake. Right mouse click to save this Podcast as a MP3. 1:8 But you will receive power when the Holy Spirit has come upon you. You will be witnesses to me in Jerusalem, in all Judea and Samaria, and to the uttermost parts of the earth." 1:12-14 Then they returned to Jerusalem from the mountain called Olivet, which is near Jerusalem, a Sabbath day's journey away. When they had come in, they went up into the upper room, where they were staying; that is Peter, John, James, Andrew, Philip, Thomas, Bartholomew, Matthew, James the son of Alphaeus, Simon the Zealot, and Judas the son of James. All these with one accord continued steadfastly in prayer and supplication, along with the women, and Mary the mother of Jesus, and with his brothers. Acts 2:1-2 Now when the day of Pentecost had come, they were all with one accord in one place. Suddenly there came from the sky a sound like the rushing of a mighty wind, and it filled all the house where they were sitting. As we saw last time, Jesus has ascended back to the right hand of the Father. The 12 apostles are now back in Jerusalem and waiting. Waiting for the Holy Spirit to come. The Holy Spirit who indwells members of the early church. The Holy Spirit who empowers and transforms them! Remember Peter? Remember how just a few days earlier he had rejected Jesus Christ and openly defied Him by trying to stop Jesus going to the cross. This Peter who was dejected and defeated. In the early chapters of Acts, we see the disciples transformed. Lets concentrate on Peter for a good example of this. This is now a new Peter, transformed by the indwelling Holy Spirit, who speaks with the authority Jesus gave the disciples. This Peter, given impetus by the Holy Spirit, who preaches a sermon and 3000 people are added to the church in one day (Acts 2v41). This Peter, who when passing by a man who couldn't walk, told him to get up and walk - and he did (Acts 3v1-11)! Peter was allowing himself to be controlled by the Holy Spirit and doing some of the things that were synonymous with Jesus' earthly ministry. What is the difference between this Peter and the Peter before Jesus' resurrection? It was only the Holy Spirit and the difference He makes to Peter. Peter, by submitting himself to the authority and power of the Holy Spirit, was allowing the Holy Spirit to control him and guide him. This Peter, who we know from the Gospel accounts, had no self-control, yet now had self-control because he submitted to the Holy Spirit. The greatest evidence of the Holy Spirit living inside any of us, is the transformation of the individual into the image of Jesus - as demonstrated here in Peter. This Peter who not only allowed the Holy Spirit's power to heal people but also administered church discipline as in the case of Ananias and Sapphira (Acts 5v10). But it wasn't just Peter who was empowered. As Acts 5v12-16 shows us, all the disciples, not just the twelve apostles, filled and controlled by the Holy Spirit, were able to do healings and other signs and wonders. The Holy Spirit, living inside and empowering all believers for service of Jesus Christ, not just the 12 apostles. All of this power delivers their passion for Jesus Christ and making Him, and Him alone, known. 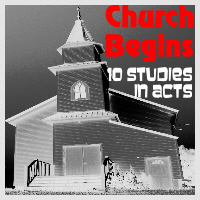 The early church was dynamic and seen to be exercising the authority of Jesus Christ. This was done by preaching the good news about him being the long waited for Messiah. Exercising His authority, by submitting themselves to Him and relying totally on the Holy Spirit alone. This power and passion however, had a cost. The early church endured persecution from the Jewish authorities, keen to exercise authoritarian rule. The early church persecuted for being Christian and preaching Jesus as the Messiah. What was the result of this persecution? Did persecution stop the church growing? That is for next time! In preparation for that, you might like to read Acts 7 & 8. So finally, remember this. The greatest evidence for the power of the Holy Spirit is not by way of signs and wonders and healings or tongues or other miracles. The greatest evidence that you have the Holy Spirit living inside you, controlling you and of you being submitted to Him is your being continually transformed into the very image of Jesus Christ. Transformed by allowing yourself to be so intimate with Jesus Christ that people will notice you have changed and will ask you why! Being filled with the Spirit, is allowing yourself to be continually controlled by Him and exercising His will, power and authority. That is one of the reasons the early church grew phenomenally and why the church is still here 2000 years later. The Pharisees and Sadducees are long gone. The Roman Empire collapsed. But... But... But... Jesus' church still stands, is still growing, and will one day be joined with Jesus in eternity, to the praise, honour and glory of Him who will return! Click on the appropriate link to subscribe to this website and receive an email when anything new is posted! Partakers seeks to encourage active Christian engagement online and resource whole life Christian Discipleship! We also seek to bring church to you, when you are unable to get to a church... Contact us to see if we can help you! This site holds podcasts and videos produced for the purposes of Christian Discipleship, Evangelism and Worship using the internet and digital technology in Digital Space. Contact us for details of how we may be able to help you! Copyright © 2018 Dave G Roberts. All rights reserved.